chilling in an ice bucket and there’s a table set for two. More to the point, the double sunlounger in this private paradise is piled high with pillows. That’s because we’ve booked the deck for the whole night and we’re going to sleep under the stars. When our butler, Roderick, hands me a flute of champagne, I almost have to pinch myself. My partner and I, on a cruise to Colombia, Panama and Costa Rica, have splashed out on “Nights in Private Places”, a nifty idea from Azamara Club Cruises. 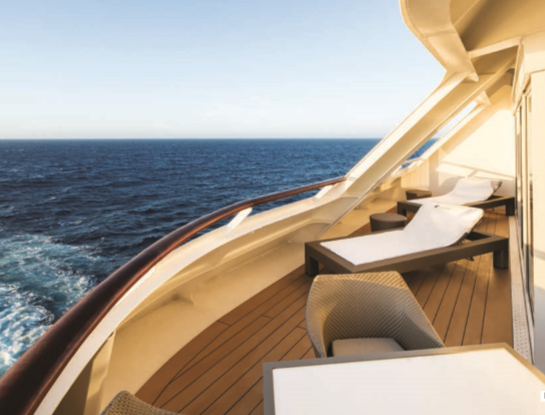 For $395 per couple, you can take over a private deck at the front of the ship’s spa for the night, with the thalassotherapy pool to yourself and a butler to cook you dinner on a hot-rock grill. Yes, it’s a lot of money, but since you could easily pay $200 each for a full-day shore excursion, why not splurge on a night to remember instead? So we drank the Champagne and tucked into grilled fish, steak and salads. When the butler slipped away, leaving behind a plate of chocolate-dipped strawberries, we floated blissfully in the pool, gazing up at the heavens. It hadbeen a windy day, but around our anchorage off the coast of Panama, all was quiet. A brisk tropical shower rattled our canopy at around 3am but we made it to sunrise, when Roderick reappeared with breakfast as the anchor came up, ready for our transit of the famous canal. 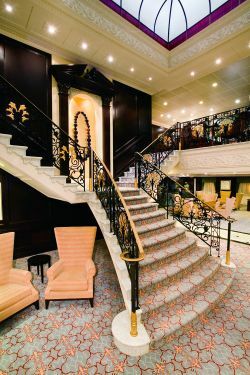 Until this year, Azamara Club Cruises was a company with plenty of enticing ideas like this – and fabulous itineraries as well – but two, 686-passenger ships that were in need of an update. Journey and its twin, Azamara Quest, are 16 years old now and the décor on both was more dark, faux-country house than boutique chic. So the company has thrown millions at complete facelifts for each one. The result of this “reimagined” Azamara, as the company puts it, are ships that could give any contemporary hotel a run for its money. Gone are the rather dated browns and oranges, replaced by tasteful neutrals in a palette of natural cream, oatmeal and stone – shades and textures from nature that reinforce Azamara’s emphasis on discovery of the world around us. All these neutrals – and there are a lot – are jazzed up by splashes of burgundy, silver and gold, while covetable items of furniture are dotted around the ship – swinging rattan chairs on deck and double sunloungers, like nests, beside the pool. All the cabins have been completely revamped, with new gold-and-white Frette linens, soft, grey-beige carpeting, a cream, leather-effect chair and oatmeal sofa (in the standard balcony cabins), as well as silver walls and an off-whiteleatherand-glass headboard. We squabbled all week over the one phone charger we’d brought along and only realised on the last day that there are built-in USB sockets, too. One of the biggest transformations is the Living Room, a gorgeous lounge at the top of the ship with panoramic ocean views. 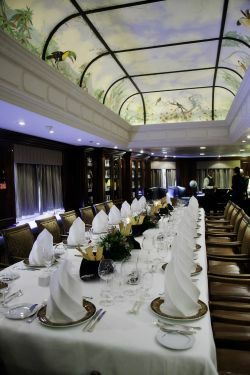 Azamara regulars will remember this space as the Looking Glass, which was always underused. Now it’s a multi-purpose lounge, filled with light and great for coffee, cake, reading or card-games by day, then cocktails after dark. A guitarist plays every evening, and there’s an enticing display of tapas to graze on before dinner. An exquisite hand-carved table seating 10 is used for wine tasting with the sommelier, a new activity offered on sea days. 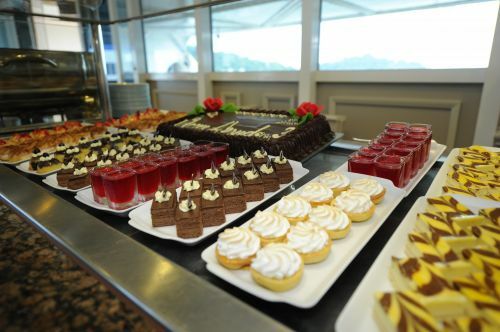 The Windows Café, the ship’s buffet restaurant, has had a complete overhaul, too, with new furniture and décor, more tables for two and an outdoor area with generous sun umbrellas and a textured granite-and-marble bar.Opening hours have been extended till 8.30pm, with themed dinners – particularly enjoyable on the aft deck in the evening sunshine. And there’s more. What used to be a basic poolside grill is now The Patio, serving gourmet burgers and brochettes by day and turning into a romantic al fresco venue by night, with tablecloths and candles and its own grill menu. I’d often see the officers eating here in the evening. Together with the elegant main dining room, this means there are three included restaurants for dinner (unless you really go wild with the tapas, in which case make that four). 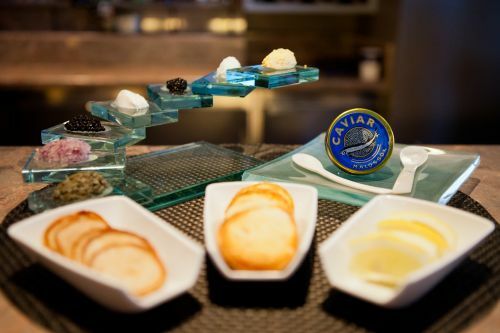 In addition there are two speciality restaurants, Prime C and Aqualina, for which you pay $25. This is great value, though, as the food is superb – crab cakes and swordfish for me in Prime C, while my steak-loving partner drooled over the ribeye and Porterhouse. In Aqualina I relished Italian classics, from tomato and mozzarella salad to delicious, creamy risotto. Because drinks are included, you don’t run up a wine bill, and the pouring wines each night were excellent, rather than the basic plonk you might be fobbed off with on lesser ships. 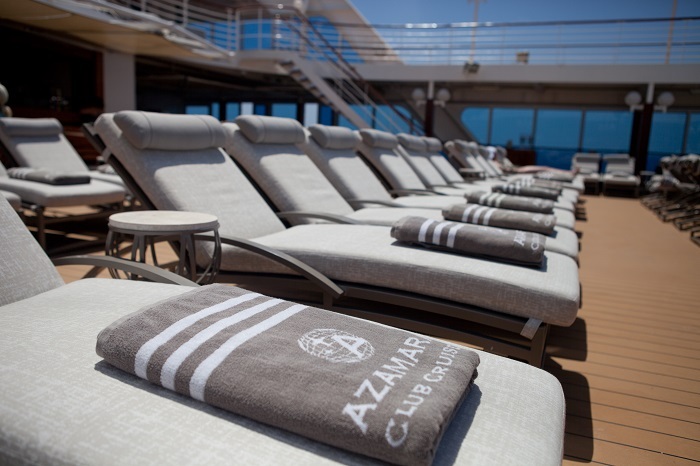 Azamara throws in some wonderful surprises for its passengers. One day the officers, in full uniform, served a barbecue at lunchtime. Another night, after we’d come through the Panama Canal, there was a “White Nights“ party on deck, with everyone salsa-dancing under the stars to a live band, the whole ship on a high after such a thrilling day. Every cruise also includes an “AzAmazing Evening” – a cultural event ashore – and ours took place in the lovely old Colombian city of Cartagena, where the whole passenger contingent was whisked into town for a piano recital in a beautiful theatre. This is all part of Azamara’s mission to offer adventurous itineraries and creative, immersiveexperiences ashore. Paid-for excursions, in addition to the standard fare, included a coffee-tasting tour in Cartagena and a day of yoga, wildlife-watching and stand-up paddleboarding in Costa Rica. My fellow passengers were a mix of North Americans, Germans and a surprising number of Brits. Several of the Brits commented that they loved the manageable size of the ship and the fact that most things are included – drinks, cappuccinos, tips, gym classes and all the snacky items such as cupcakes at the Mosaic Café and tapas in the Living Room – extras where other cruise lines sneak in supplementary charges. The atmosphere is fun and sociable. The fact that there’s no queuing – no fighting for sunloungers, no long lines at the buffet, no waiting ages for a lift – puts people in a good mood. There’s no messing around with dress codes, either; it’s casual throughout, though people dressed nicely anyway. And then there’s the crew, who are unfailingly smiley and helpful, from the cabin stewards up to Captain Johannes Tysse – a Norwegian with a cracking sense of humour – and cruise director Eric De Gray, a talented entertainer in his own right. Azamara’s guests really do follow the crew (and the company has a helpful “Senior Officers” section on its website for this very reason, telling you who’s driving, who’s entertaining and who’s cooking on every cruise). “I’ve sailed with Ryszard [the hotel director] since he was a young waiter on Celebrity Cruises,” one lady enthused. It’s wonderful that the “reimagined” ships are now a match for the fabulous places they visit, but service that inspires this level of loyalty is the final piece in the puzzle. On-shore trips vary from basic sightseeing to quite expensive, exclusive experiences costing upwards of £150. A half-day sightseeing tour of Cartagena with a guided walk and a couple of hours of free time costs £26.50, or £40.25 for a similar length tour by horse-drawn carriage. A city tour in a small group, including lunch in an 18th century fortress, costs £149.